1942 – Monday and I Dont feel so good today. Dad worked Day. they are Riggin up Still looking for Bud. I wonder what happened to Bud in the 1942 entry? Was he working with Grampa and didn’t show up for work? It doesn’t sound like he lived with them at this point. Maybe he just hadn’t checked in for a few days? 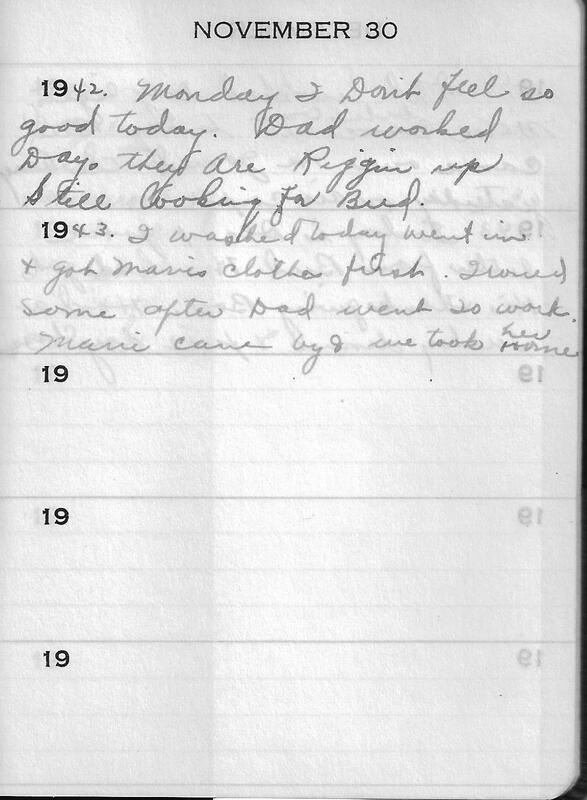 In the 1943 entry it sounds like she still takes care of Marie’s clothes. Marie would be 19 at this point. Perhaps she is living where there is no facilities to wash clothes. This entry was posted in Tennant, Wright and tagged genealogy, Martha Marie Tennant, Martha Marie Wright, Martha Marie Wright Tennant, Martha Tennant, Rene Baron, Sylvia Rene Stevens. Bookmark the permalink.